Pixar's speedy franchise rolls on to a third chapter preoccupied with obsolescence and getting tune-ups. The racing world is changing in this latest Cars escapade from Pixar. A new generation of fast, efficient motors have arrived on the scene, and a dramatic crash leaves an aging Lightning McQueen (voiced by Owen Wilson) facing retirement. Unfortunately for any parents bored of the franchise or irritated by the premise—why would cars go to a bar and grill? Why?—the now–not-so-cocky racer is refusing to hang up his tires. Despite his flabby wheels and creaky joints, Lightning is desperate to keep racing and to avoid becoming merchandise (ironic, considering Disney is already selling Cars 3 swim trunks). In an attempt to get his engine revving, he joins a new training facility, complete with track simulators, VR and perky personal trainer Cruz Ramirez (Cristela Alonzo). Her story of self-doubt and female inclusion is engaging, while the rest of the plot meanders toward the race to potentially end all races where Lightning aims to beat his latest nemesis, newbie Jackson Storm (Armie Hammer). Cars 3 is entertaining enough, delivering the baseline visual joys of this series’s sweeping landscapes and attention to detail. There’s a lot of predictable mush about following your dreams, turning negatives into positives and having the confidence to truly believe in yourself. It’s all well and good for the under-12s, but this movie never packs the kind of emotional punch we know Pixar is capable of. When it comes to filmmaking, sequels are rarely as good as the original. So a sequel of a sequel, a disaster right? Wrong! Cars 3 is a wonderful piece of animation from Pixar and Disney studios. I have to admit I had doubts and if it wasn’t for being given free tickets, I wouldn’t have gone. But I’m glad I did, because I enjoyed the film so much more than I first expected. 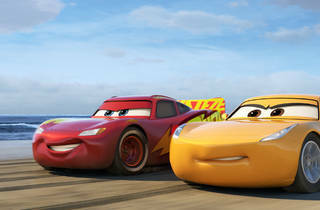 When newer, faster cars are appearing on the track, McQueen suddenly has to rethink his life and career. This plot hits home hard for grown-ups. It’s about learning to rediscover your dreams and purpose as you get older and your priorities change. Wonderfully done and full of tact, it’s a story adults will love. As for the kids, it’s teaching them great values and lessons. I am so glad they get to watch movies like this. Because life isn’t always about being the best or being the ‘chosen one’. Sometimes it’s about learning to be happy whatever life brings. A wonderful movie that truly deserves the Pixar stamp!